"For my CAGR project, I wanted to curate an exhibition as way of re-contextualising classical art for a new audience - one for whom it may not be an obvious or immediate attraction - and to re-present it in a way that appeals beyond the academic and esoteric". Opening in March 2015 at the Breese Little gallery, CLASSICICITY will bring together ancient and contemporary art in a dynamic display that spans diverse media, styles and epochs. The exhibition will centre upon a juxtaposition of Greek and Roman antiquities with works by international contemporary artists who engage at multiple levels with the classical world and its afterlife throughout art history. CLASSICICITY will establish multiple dialogues between the ancient and the modern – aesthetic, conceptual and narrative. It will re-present the classical through the lens of the contemporary while also setting contemporary art inside a classical frame, asserting the continued manifold influences of Greek and Roman art. The show will ask us to look at Greek and Roman antiquities not as museum artefacts but as seductive, emotive and provocative works of art. It will refute the idea of a stable and definable ‘classical tradition’ in art, proposing that contemporary responses to the classical are as eclectic and multilayered as the classical past itself. The works in the exhibition will articulate a myriad of possible ‘classicisms’ – setting forth a dynamic, shifting and open-ended territory of classicicity. 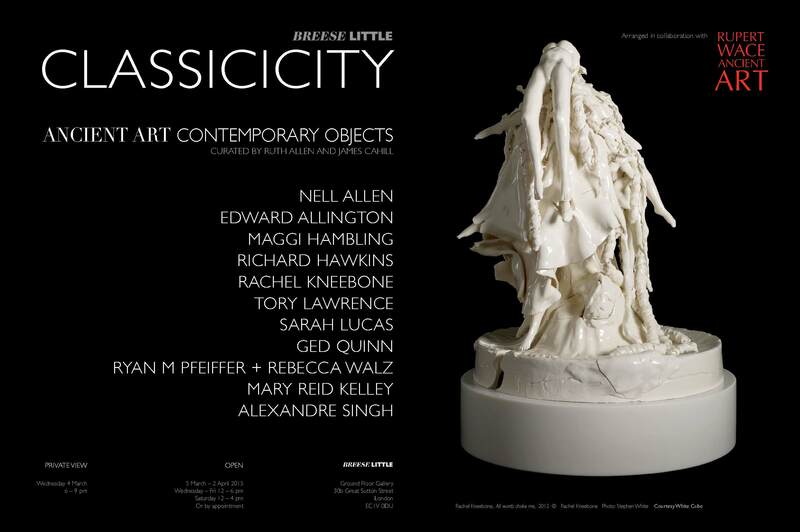 CLASSICITY is curated by Ruth Allen and James Cahill, and arranged in collaboration with Rupert Wace Ancient Art. The exhibition will include works by a range of leading and emerging international artists, including Edward Allington, Maggi Hambling, Richard Hawkins, Rachel Kneebone, Sarah Lucas and Alexandre Singh. Ruth Allen is a PhD researcher at the University of Cambridge specialising in Roman art history and visual culture. She is currently working on mythological imagery on engraved Roman gemstones. She graduated with a first class BA (Hons) in Classics from the University of Cambridge and went on to gain a Masters with distinction in the History of Art at the Courtauld Institute of Art before working as an Administrator/Junior Specialist at Christie’s. Ruth blogs at tumblr.com/blog/ancientedges.